Iron Bean Coffee Company was established in February 2017 after the owners, husband and wife Fred and Chanell Dedrick, spent over 18 years dreaming of opening a coffee shop with a more interactive, human experience than traditional coffee houses. Due to the costs associated with starting a new business, they started online mailing craft-roasted coffee to customers and preparing the beans at home. Along with the bags of coffee they frequently added merchandise and other gifts, including hand-written notes from Fred and Chanell, adding the human element they were looking to achieve. Fred and Chanell promoted their new coffee brand using more common, lower-priced types of merchandise, including hats, travel tumblers and keychains during the company’s infancy. Very quickly though, Fred noticed that the hand-feel of those promotional products began to dilute their brand and story. He and Chanell decided to search for companies producing high-end promotional products for their brand. Sunset Hill Stoneware was willing to bring their cutting-edge brand story ideas to life. 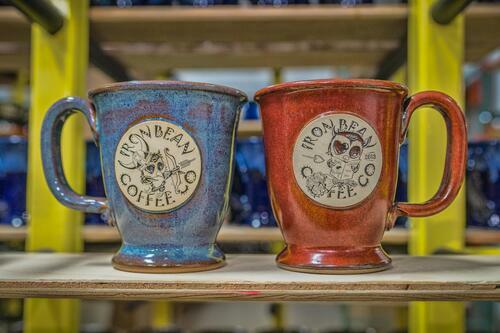 The stoneware company allowed Iron Bean Coffee Company to explore original ideas, which energized Fred and Chanell, engaged their fans and ultimately benefited their business. Download the case study using the link to the right or contact Sunset Hill Stoneware to see how we can impact your bottom line revenue like we did for Fred and Chanell.